Got a call from Kathleen @ Bird TLC office this afternoon. 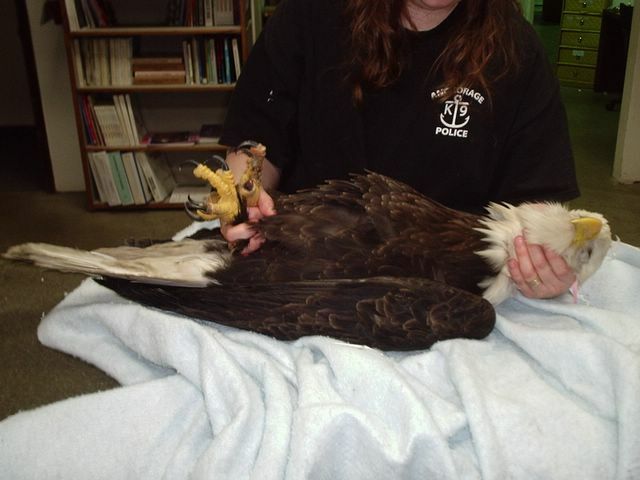 There was a bald eagle coming in on ERA Aviation flight from Kenai @ 6PM. It had been caught in a trap and had lost one digit on it's right foot already. She wanted to know if I could pick it up. You know my answer, you betcha! I picked it up at Alaska Airlines Air Cargo @ 6PM. They were on time. Thanks to ERA & Alaska Airlines for their help. Off to Bird TLC. Cindy and Ruth were there waiting when I arrived. We removed him from the kennel and started an examination. We found one digit missing from the right foot, one digit probably dead, a deep puncher on the left foot pad, he was severly dehydrated and exhausted. IV was started immediately to get some fluids in him. We also tube feed him for he had a sharp keal from probably not eating for a few days. His weight was at 3 kilo grams, a little on the light side. We placed him in a mew. He was standing on his own, but was disoriented. Tomorrow morning he'll get another IV and baytril. We'll keep our feathers crossed.